My main take-away from this year’s NAD was that the “flavor-scapes” of a culture can bring you closer to them than just about anything else. Proust and his madeleine cookies are probably the best-known literary example of how the taste, aroma and texture of food invokes the past, but now I can add hard-boiled eggs with honey, pepper, lovage and pine nut sauce and carrot and apple stew in hard cider with dill to the list. I was quite surprised by the fact that most of the visitors to my station were willing (sometimes with a bit of prodding) to try some pretty strange-looking (by modern standards) food but even more gratified by the positive responses, which ranged from “Wow, weird but really good!” to “That Apicius could have done OK for himself with a restaurant here in Milwaukee!” Based on the number of people who took recipe cards (the stuffed dates were a hit, too, as was Cato the Elder’s olive “tapenade” I would guess that quite a few people will be conjuring up the flavor-scapes of ancient Rome and continental Celtic Europe at home this winter. One of the interesting things that I tried to illustrate during this year’s NAD was the relationship between food and social status. In the modern world, we connote the rich with “champagne wishes and caviar dreams,” and antique societies had many similar pretensions surrounding food-particularly in the distinctions between those that drank wine and those that drank beer. Wine was the drink of the civilized man, according to elite Greeks and Romans, whereas the barbarians were the ones who drank beer. As many visitors to my station on Roman brewers (called Cervesarii) remarked, this distinction remains even today. Whereas the rich imbibe fine vintages from Napa and Bordeaux, the blue-collar worker drinks and indeed identifies with brews such as Miller Light (a point of pride here in Milwaukee) and Budweiser. This perception is reinforced in commercial advertising; just watch a Packers game. The interplay between food and identity was something I found visitors wanting to discuss in regard to the Roman brewers. In antiquity and today we advertise identity, perceived status, and even social values through the consumption of certain types of food and drink. Dare I say that this is all more food for thought? Archaeological and ethnographic evidence suggests that pre-Columbian cultures of Mesoamerica and South America brewed a beer using corn as the primary fermentable ingredient. Corn or maize beer, commonly known as “Chicha,” was described by Spanish chroniclers who made contact with indigenous groups from Mexico to Brazil. 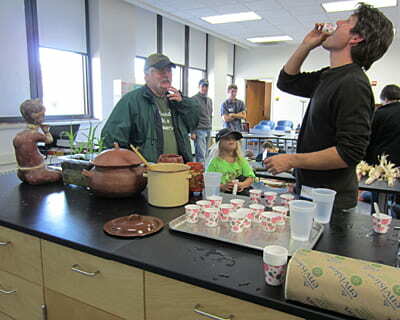 For National Archaeology Day in Milwaukee, professors, students, and the general public, chewed and spit water-soaked maize kernels (“Indian Corn”) with great enthusiasm into a ceramic vessel. Human saliva contains enzymes that convert starches in the corn to sugars, which act as food for yeast, resulting in alcohol and CO2. Meanwhile, a digital presentation about the archaeology and lasting legacy of consuming chewed corn beer in the Western Hemisphere, gave context to why we were masticating maize and spitting it into a clay pot in the first place. This corn mash must then be boiled and cooled before adding the yeast and fermenting it for a week. The resulting chicha ale will have a distinct corn flavor with a slightly sour finish. A toast to Hunab’ Ku, the Mayan Corn God, and all the ancient deities around the world that are credited with bring beer to humanity. Cheers! I’d love to give a hearty thank you to Mesoamerica for its gift of chocolate and maize. What could be better than merging the two foods together in atole (a maize and chocolate drink); in mole (a savory sauce made with myriad chilies and chocolate) on handmade corn tortillas that visitors could make themselves; and in chocolate tamales? Visitors also sampled a very delicious, traditional hot chocolate drink with chilies and spices while learning a bit about the spread of maize to the world and about the exquisite history of chocolate. 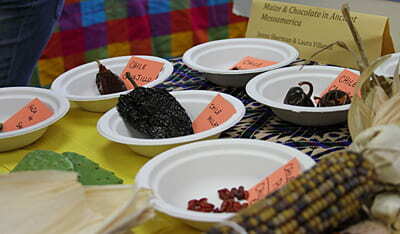 I enjoyed people learning that chocolate could be something other than “sweet,” as well as how nicely the taste of cacao complements maize and chilies. For anyone interested, the recipe for chocolate tamales is available [click through to recipe]. I enjoyed making tamales for NAD with my cousins and sharing stories and laughter. Try the recipe and create your own memories. Buen Provecho! I first heard the rumor about Franz Boas’ recipe collection while I was an undergraduate at St. Lawrence University. Apparently, among the ethnographic information he collected from the Kwakiutl was a recipe for blueberry pie! I tracked down a collection of these recipes, but there was no blueberry pie. Boiled sea slugs, barnacles, salmon, sure, but sadly, no pie. The recipes are illuminating in so many ways; not only do they describe what was being cooked, but for whom, by whom, and the entire context of the meal. For my National Archaeology Day project, I attempted to replicate the recipe for “mashed steamed crabapple”. Finding the ingredients turned out to be a bit of a trick, but I did have the stone hammer called for by the recipe to smash the apples. Several people took a turn with the hammer, trying to mash the steamed apples. The apples went flying! Had there been a dog around, there would have been plenty to pick up off the floor! This time, I used pork fat for the oil called for in this recipe [click through to recipe]. Next time, I’ll see if there is any blubber available! 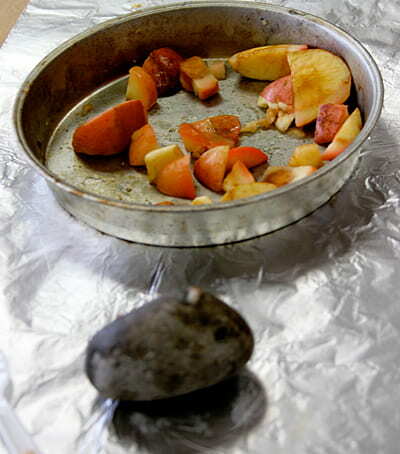 What can XRF analysis, a non-destructive technique, tell us about food residue in pottery? After demonstrating the technology and explaining its use, I challenged visitors to answer that question, and received thoughtful answers. The conclusions from these “citizen scientists” ranged from knowing what the chemical signatures of the commonly prepared foods are (to differentiate this from the pottery’s chemical signature) to building a comparative database. 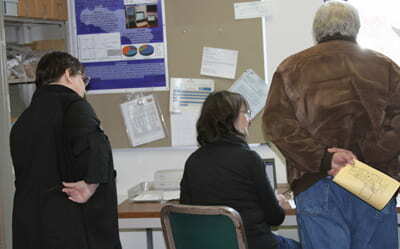 People were intrigued by the technology and its applications for archaeological research. Author J.R.R. Tolkien once wrote, “If more of us valued food and cheer above hoarded gold, it would be a much merrier world.” Food inherently brings us simple joy that some of us take for granted in our daily routines. 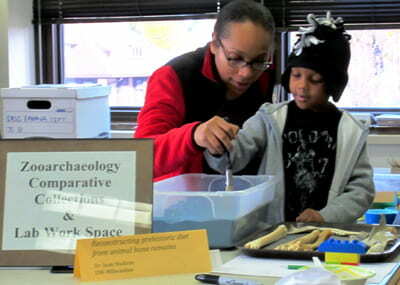 However, this past National Archaeology Day, that was not the case. 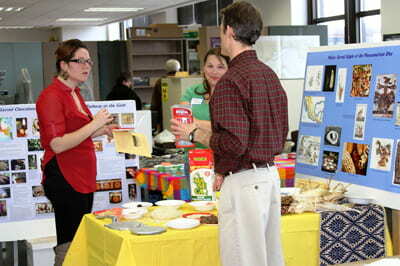 Throughout the afternoon, students, children, and adults alike were able to see presentations and try different foods from past cultures around the world, often with smiles on their faces. Our group decided to focus on the evolution of grinding from historic tools to modern equipment. 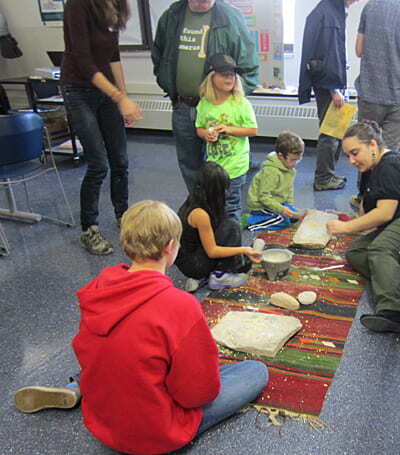 Children seemed especially fascinated in using the stone metates and mortar and pestle we had on display, so much so that many of them ended up with a healthy dose of flour on their clothes. 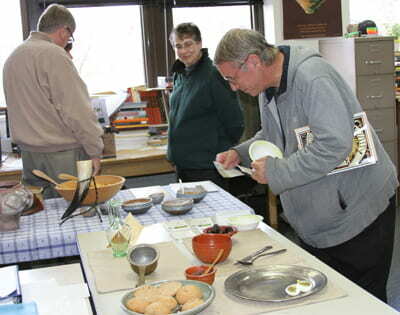 The variety of food and recipes gave visitors insight on the challenges of cooking without contemporary conveniences and a taste of foods that many of us previously have never seen or heard of. An unexpected impact of this presentation was convincing our young visitors that brushing your teeth is essential! 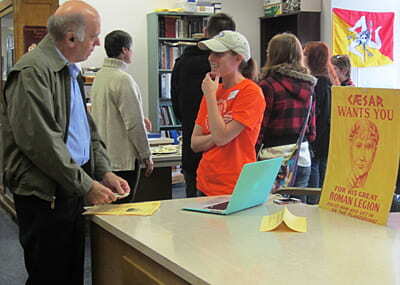 As I pointed out caries, cavities, and the overall poor dental health of a young man from the Milwaukee County Institution Grounds (MCIG) collection housed at the University of Wisconsin-Milwaukee, many visitors said they were going straight home to brush their teeth. Visitors were also impressed by how poor nutrition could affect the skeleton as I showed them examples of linear enamel hypoplasia, porotic hyperostosis, and cribra orbitalia. 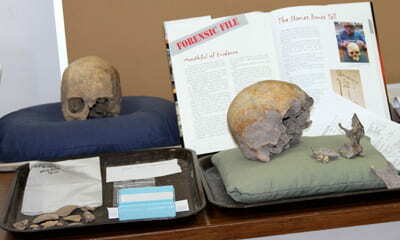 The presentation hit close to home for many, since the skeletal materials used for the demonstration are less than 200 years old, and are from a local cemetery. People gained new perspective on what life was like for the poor people in Milwaukee County not so long ago, and how access to good nutrition is still an important issue in modern times. Fortunately for all concerned, the Zooarchaeology part of this event involved only animal bones, and none of them fresh, so no one actually ate anything at our table. Everyone did, however, with good humor, test their abilities to tell deer bones from those of birds and fish (not always as easy as expected). Our youngest visitors were especially fond of helping to excavate the bones and tally the results – by the end of the day the deer had won as the primary contributors to our version of prehistoric diet.